Paper presentations : Fiber optics communication ~ Engineering projects ideas for final year students & paper presentations collection blog. Fiber optics is one of the well developed communication medium, Though this fiber optics communication is an important paper in the engineering syllabus the basics of these subjects were been studied and understood during our high schools. the concept is very important for the communication engineering students. Even though the fiber optics communication is a wired mode of data transfer while the world is moving with the wireless, it is still famous because of the amount of data it could transport in a short time with unimaginable speed and least loss possible. this optical communication cables use light as source of data so because of this is will escape the external field losses and more. Initially this type of cables were been used to connect major international networks but in later times these cables are used from a small town network to a home setup for improving the efficiency and bandwidth of the network. This can also be blamed for one of the main reasons for high speed internet access that we enjoy today. Using these kind of paper presentation in the classes can be highly effective for a seminar and internals. If you are planning to use this paper presentation for a higher level events, we would like to advice you to take up the issue seriously and do some research about the trend and improved technology on this topic fiber optics communication. You can also make use of our Request any new paper presentation form to apply. 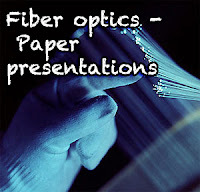 Sample of the fiber optics paper presentations : The best way to describe the current technology being deployed is to provide a brief case study of a company that extensively uses optical fibers. I have chosen Energies PLC, a British Company that is currently expanding its network throughout Europe. Their network exclusively uses single-mode optical fibers. Partly due to their commercial history a large number of their fiber cables are installed on lines belonging to the National Grid Company and to some regional electricity companies. They also use cables buried in ducts under roads and pavements. They use DWDM (some uni-directional and some bi-directional) with 10Gbit/sec on each of 4 wavelengths. They are currently introducing 32 wavelength systems, and will inevitably introduce 40 Gbit/sec-per-wavelength systems in the near future. Their optical repeaters (for which they use EDFAs) are typically spaced at around 80km and their regenerators can be up to 600km apart, although this is partially dependent on previous repeater locations. New technologies that are emerging will theoretically increase the regenerator spacing to 5000km (and even further with the introduction of soliton transmission), although DWDM does reduce the allowed distance between amplifiers and regenerators.